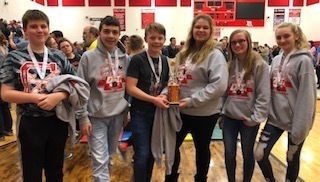 Three teams from Columbiana Schools have qualified for Destination Imagination Global Finals competition. Globals will be held in Kansas City, Missouri at the end of May. CHS/CMS Technical Team (High School and 8th grade students- Finn Carney, Cameron Fortune, Darius Surgenavic, Keaton Surgenavic, Colin Snyder, and Marco Cagliuso. The teams have competed at Regionals , State, and have earned the right to advance to Globals.